AMDA has formed a multi-national medical team which conducted relief activities in response to the recent flood in India. AMDA has also received cooperation from AMDA India and local cooperative bodies such as the Chengannur Rotary Club and Sewa Bharati. 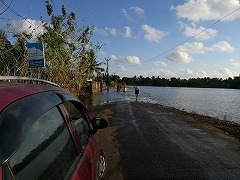 After completing their activities in Karnataka State on 5 September, the AMDA team returned to Kerala State to continue providing medical relief there. 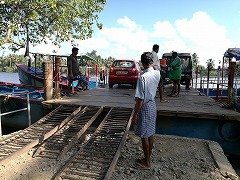 On 7 September, the team headed for an island which was in great need of assistance five hours by car from Chengannur City. However, it was already almost sunset by the time they reached a nearby village, so they were forced to abandon their plans to cross to the island. According to a local, the damage caused by the flood is still easily noticeable and even the water has not yet fully receded. The next day (8 September), the team consulted local doctors about how to best continue the relief activities. It was decided that medical relief is to be conducted once per week for a period of four weeks, under the lead of local doctors. The team then purchased additional medicine in preparation for the coming weeks. With that, the AMDA Headquarters coordinators had completed their mission, but they will continue to monitor the situation closely together with local staff. 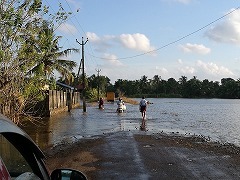 Upon hearing that local fisherman in all affected areas desperately worked to save people from the flooding soon after it happened, the AMDA coordinators spoke to some of them. It was revealed that many of them had been very young when the 2004 Indian Ocean earthquake and tsunami happened, and they had been victims themselves. One of the fisherman said, “When that tsunami happened, I was just an elementary school student and could do nothing to help, but I did realise that I was a disaster victim. Ten people from my village were killed by the disaster, which is a terrible memory, but we received help from many people and we were able to get back on our feet. When we realised we could do something to help this time, we wanted to help as many people as we could”.